With the same great features as the original, Scorpion® SM is 10% smaller for people with narrow faces. 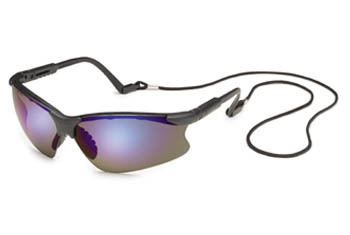 •Scratch- and impact-resistant, hardcoated lens blocks more than 99.9% of UV-A and UV-B light. •Free "Scorpion's Tail" retainer helps prevent loss and damage. •Meets or exceeds ANSI Z83.1 standard. With the same great features as the original, Mini Starlite® is 10% smaller for people with narrow faces. • Lens blocks more than 99.9% of UV-A and UV-B light. • Meets or exceeds ANSI Z83.1 standard. GENESIS SMALL SIZE: Wrap-around, uni-lens style for superior coverage. Flexible fingers on nosepiece conform to a variety of nasal profiles. 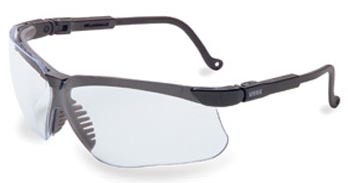 Frame and lens are 6% smaller than Genesis to fit slimmer facial profiles. Meets ANSI Z87+ and CSA Z94.3 standards. • Our small size Challenger will provide good fit for small featured individuals. Women often end up using safety glasses that are to large to fit well. Children also require protection, be it for school shop or mowing the lawn.